Newson H. Shewitz, known to his friends as “Bucky,” is a native of Detroit. Shewitz attended Carnegie Tech (now Carnegie-Mellon) in Pittsburgh, where he majored in Industrial Design and received a Bachelor of Fine Arts degree. 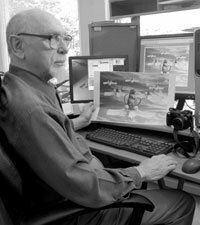 After serving during WWII in an engineering map-making detachment, he took photography courses at the Army University in Biarritz. Upon returning to the U.S., Shewitz came to Cleveland where he joined forces with a classmate from Carnegie Tech and an army buddy to form a business-to-business advertising agency from which he is now retired.